In the EU we want to grow our knowledge economy. To do that, we have to ask ourselves two very important questions: What will the future knowledge economy look like? and What should we use all this knowledge for? The answer to the first question is evident. A healthy knowledge economy relies on the quantity, quality and accessibility of data. In the 21st Century, we can be sure that means quantity of data on an international scale, across international research institutions. We can be sure that the quality of data will be vetted by scientists from across the globe thanks to global communications and we can be sure that the accessibility to data will become increasingly universal, increasingly open and require new business models. Therefore, any European knowledge economy of the future must be swift to adapt and open to the World. The answer to the second question, Europe cannot answer alone, but for ourselves we’re answering it based on European values. Yes we should use this knowledge to create new products and businesses − to create employment and economic growth − but we should do this in a way that also creates prosperity and well-being. We can do it in a way that provides the very solutions we need, to tackle global challenges like food security, safe drinking water, clean energy and public health. 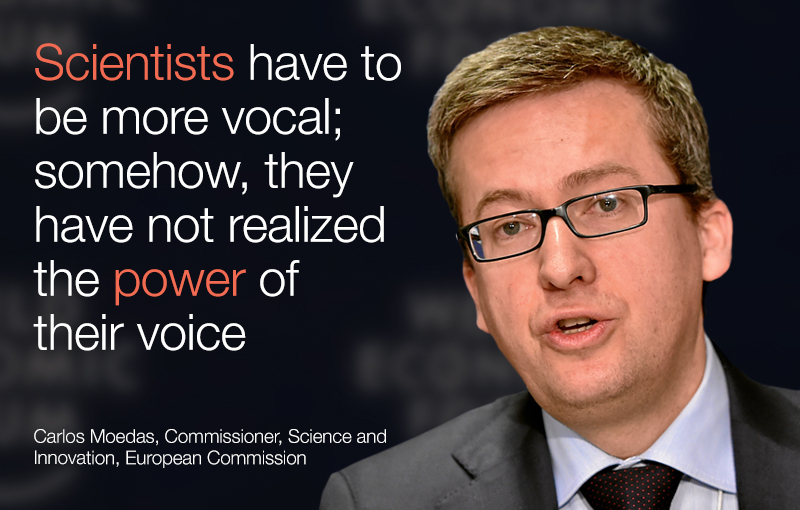 This is why my three priorities are “Open Innovation”, “Open Science” and “Open to the World”. My mission is to support and invest in a European knowledge economy that can take advantage of the global transformation in research − that provides new opportunities to European citizens – using the advancement of scientific endeavour to contribute to global prosperity. As Europe looks to the future, as it develops a lucrative, values-oriented knowledge economy, clearly one of our most exciting partners is China. The global knowledge economy is set to grow and it is set to experience a magnetic pull towards the East. Without a doubt, China is innovating. Without a doubt, Chinese potential in science and technology is massive. China’s economic rise has been one of the most notable achievements in recent history: reducing poverty, investing in education, establishing a vast middle class, encouraging innovation and entrepreneurship, building world-class scientific facilities and research infrastructure. The OECD predicts that by 2030, “China and India will supply more than 60% of the G20 workforce with a qualification in science, technology, engineering and mathematics”, while McKinsey points out that China continues to flourish “in industries where innovation is about meeting unmet consumer needs or driving efficiencies in manufacturing.” Lenovo is now the world’s leading computer manufacturer. More innovation-friendly regulation is supporting new business models and start-ups in China and Chinese public and private investment in R&D is now more than 200 billion dollars per annum. So, China is racing ahead in its own distinct and rapidly evolving way. China is an essential partner in international research and cooperation with China is more important than ever, because the challenges we face are many and they are global. Our resources, our responses, will be put under increasing strain in the years to come. There is more and more demand for safe drinking water, for food, healthcare and energy – the four thematic priorities of my mandate. Humanity’s influence on the climate system is both evident and increasing. We face serious flooding, prolonged water shortages, heat extremes, earthquakes and, all the while, our global population is rising. As our economies grow, so does the gap between rich and poor. These challenges will require global efforts in research, science and innovation to serve our planet and to serve its increasing population. As European and Chinese policymakers, we have an ever-increasing pool of educated citizens and an ever-increasing need to solve common global problems. The logical solution is therefore to pool our resources, to work together wherever possible, whenever possible. My understanding is that long-term progress in EU-China research cooperation will depend on keeping funding and data open to each other: meaning the further openness, commitment and investment of resources on both sides. That being said, we mustn’t forget that sharing knowledge − that sending researchers abroad to experience other societies − is about more than solving global problems or boosting the economy. Every time, it is another opportunity for one human being to open the eyes of another − for one researcher from the West or the East to enrich the life and understanding of another. For wherever you find science, wherever you find knowledge, you will find diplomacy. Continent to continent. Peer to peer. Will the on-demand economy raise global living standards?